The best toys for 18 months to age 3 are very simple, sturdy, and realistic. Look for toys made from wood, thick plastic, metal, fabric and built to last. Toddlers are in a testing phase, and will push the limits of any toy material. Movement and active play is really important, as toddlers are building the skills of balance, running, throwing, climbing, etc. Be sure you have items available inside and out that allow for these big movements in a focused, purposeful way. In toddlerhood, your child is taking on bigger challenges than ever before. Children this age are keenly interested in helping and mimicking what they see people do around the home and in their world (capitalize on this while you can!). Include your toddler in daily activities around the home, and offer her tools to learn these skills on her own. See below for examples. Check out all the tools over at For Small Hands. Children this age need quality tools that really work, sized to fit their smaller hands. There's tools for the kitchen, for the garden, for cleaning, and more. These toys offer a limited amount of pieces and a chance to explore gravity, movement, and other natural forces at work. 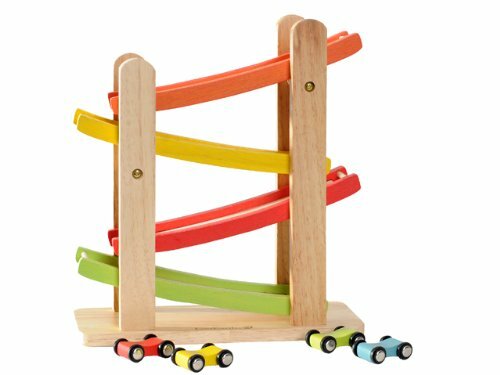 The car racer track pictured is perfect for this age. I also love this simple wooden train set from HAPE toys. There are many excellent building block sets. Look for high quality wood or sturdy plastic that will stand up to years of play. For this age, I highly suggest keeping only about 25 pieces available at once, to help with clean-up and toy managment. If you find a set with more, just save the rest for when your child becomes a bit older. 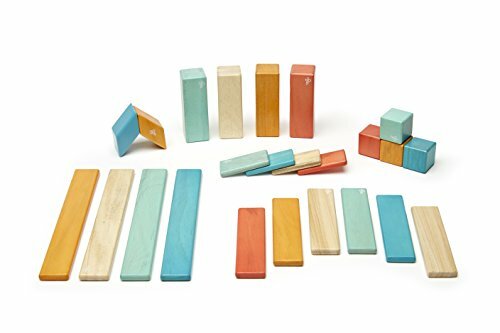 These magnetic wooden blocks from Tegu are pretty awesome, especially for travel. One of the MOST valuable gifts for toddlers (and their parents) is spending time together. Offer to babysit! Go visit a children's museum, take a hike, or play together. Here's an active activity your child can do indoor or out! I prefer softer pins for this age to help with noise and for safety reasons. There's a handful of plush or plastic bowling sets from Melissa and Doug, but this handmade set is from CrochetFanaticDesign is my favorite by far. Ride-on toys offer another chance for big, coordinated movement inside or out. Look for models with limited colors, quality construction, and no lights, buttons, or sounds. 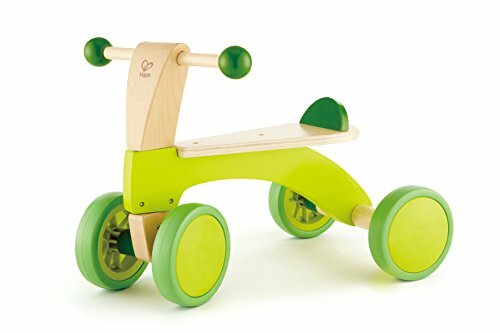 This trike from HAPE toys offers a slightly greater challenge with a front wheel that steers, but without any petals to get in the way. For younger toddlers, start with a Wheely bug. 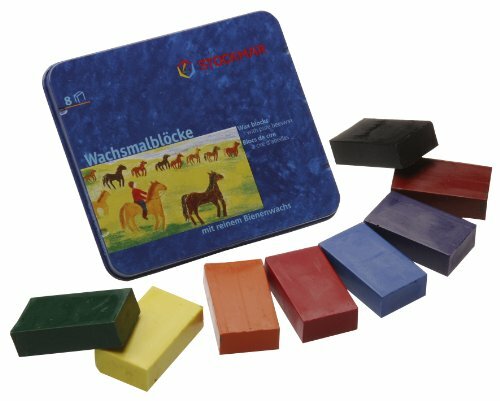 These beeswax crayons from Stockmar offer bright color on the paper, and fit well in a toddler's hand. Other great art supplies include play clay, removable stickers, and washable paints. 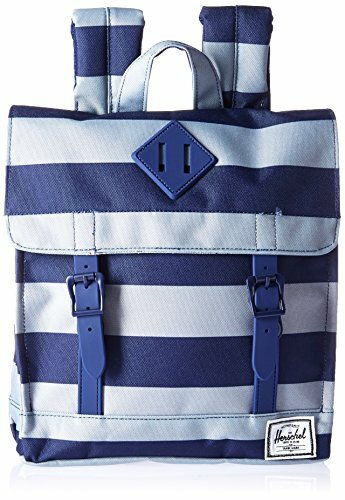 A child sized backpack with pockets for treasures is a must for daily walks. This one is from Herschel and at 10 inches square, it should fit most toddlers and preschoolers. The magnetic closures and one zippered pouch are manageable skills to master, but any smaller backpack with a zipper, Velcro, or fold over flap would work for this age. I recommend a smaller pocket on the back or side, and a pocket for a water bottle is always welcome. Books for this age should have 3-7 words per page, and bright, inviting illustrations. There are plenty of books for children with lovely little stories, don't settle for boring books. Your toddler can understand much more than they can say. Even better if you make a book about your child! I suggest a fabric version with photos for toddlers, like these from greyblueskies. Simple wood puzzles with knobs are an appropriate challenge for this age. 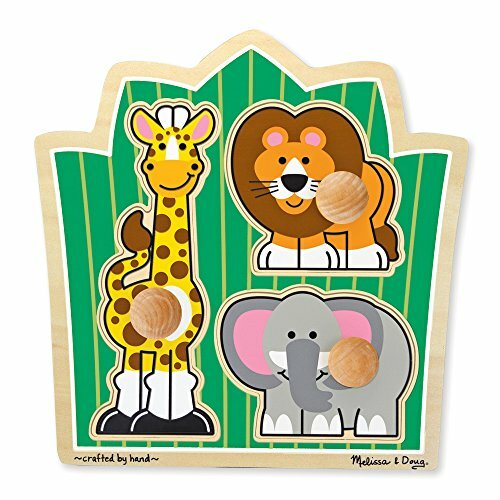 Melissa and Doug make several excellent ones, and so does Guidecraft. A doll encourages gentle care play and a chance to play grown-up. I have also used dolls to illustrate self-care activities, gentle touch, teach body parts, and as a third party in grace and courtesy lessons. Bamboletta makes beautiful handmade dolls of heirloom quality. You can also find a wonderful handmade doll on Etsy, like this one from Pingvini. I’m also a fan of the soft dolls from HABA toys. Toddlers are fearless climbers. Keep an appropriate, safe place to practice these skills inside for those rainy, cold days. I used one of these Pikler Triangles in my parent-child toddler classes, and I love it. There's graduated difficulty and multiple ways to climb, so it can grow with your child. It folds up, and it's beautiful. And most importantly, the triangle allows your child to test her own skills and learn how to move safely. Add a climbing ramp for more challenge and variation! Simple music instruments are lots of fun at this age, and this harmonica from Hohner is perfect. The bag says ages 3 and up, but I used this with a 20 month old and felt perfectly safe to have it in his mouth. 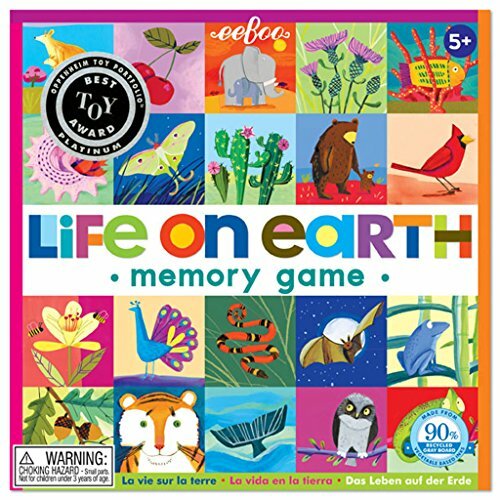 Here's another game that offers a few ways to play together, or on your own! These photo tiles can be matched together, used in a memory game, hidden for a lost-partner treasure hunt, or whatever else you can think of! Look for a wooden or thick cardboard version for toddlers.